Microsoft really wants you to buy the Kinect, going so far as to spend nearly as much money as it did for the launch of the original Xbox. 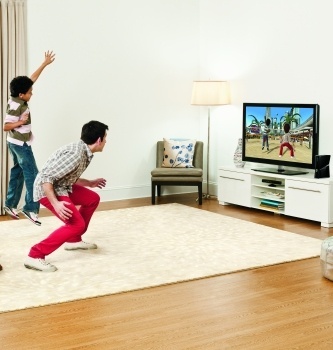 Microsoft is banking pretty heavily on Kinect's ability to be a colossal holiday hit. That's probably why the company has committed roughly $400 million to promote its new controller-free interface. According to the New York Post, the marketing plan involves everything from appearances on soda cans and cereal boxes, not to mention the usual TV, internet, and magazine spots. Robert Matthews, Microsoft's General Manager of Global Marketing Communications for Xbox, explained that "Kinect is the largest, most integrated marketing initiative in Xbox history, bigger than its launch. We are going to be spending millions to launch this globally." "Millions" is an understatement, actually. Microsoft is going to spend nearly as much as it did when it first launched the original Xbox console. Back in 2000, Microsoft spent $500 million on the console's launch (though, admittedly, some of that went to subsidizing the actual hardware to make it more affordable for consumers). The Kinect marketing strategy involves partnerships with groups like Burger King, Pepsi, and Kellogg's. The full media blitz is outlined by the Post, but some of the more predominant plans involve taking over YouTub'es home page and blanketing Nickelodeon and Disney "digital properties." Also, roughly 7,000 retailers will stay open for midnight launches of the system on November 4th. It's not terribly surprising that Microsoft wants this launch to be as big as possible, seeing as how game hardware sales are slowing down. That said, $400 million is a lot of money. I guess we'll have to wait and see just how successful things turn out to be after the Holiday Shopping Season.